How many times have you wanted to listen to music of a certain genre or feeling, but couldn’t pinpoint a specific artist to fit your mood? For the indecisive listener, Syntonetic’s Moodagent, which has been updated to version 2.0, can offer vital assistance for your musical well-being. A mobile app that profiles your iTunes library based on emotion, mood, genre, sub-genre, style, tempo, beat, vocals, instruments, and production features, Moodagent uses methods similar to Pandora or iTunes’s Genius playlist to categorize your tracks. It goes the extra mile, however, by selecting songs for you based on your own mood. Use a set of sliders to tell Moodagent just how sensual, tender, happy, or angry you feel, and it will find the songs that best match your mood and organize them into a playlist. 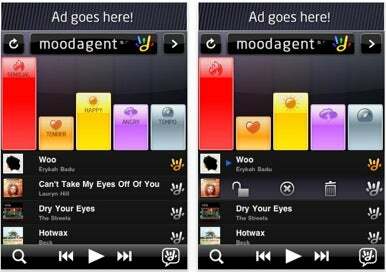 You can also have Moodagent build a playlist based on the characteristics of a song that you “seed” it. Another benefit Moodagent holds over streaming programs like Pandora is that it doesn’t rely on your phone’s internet connection to get music for you, thereby saving countless megabytes of data on your soon-to-be limited data plan. Recently updated to version 2.0, Moodagent now lets you regulate the size of the playlists it produces, anywhere from one song up to 50 songs. You can also broadcast your playlists on Twitter and Facebook, potentially introducing your friends to new music. Other new features include the ability to refresh or create multiple playlists from a single slider setup, and lock individual tracks to ensure that they remain on a playlist each time it is refreshed. Moodagent 2.0 is compatible with iPhone, iPod Touch, and iPad running iPhone OS 3.0 or later and is available on the App Store as a free ad-supported version and a $5 ad-free version.